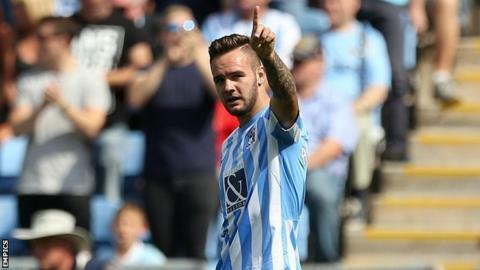 Adam Armstrong admits he has set high standards for himself after marking his Coventry City debut with his first professional goals in their opening-day victory against Wigan. Striker Armstrong, 18, on loan from Newcastle, got both goals in Saturday's 2-0 win over the Latics. "I've set my standards now and hopefully I can get more goals," Armstrong said. "I want to push on as a player and score as many goals as I can." Armstrong is with Coventry until mid-January and brings Premier League experience to the Ricoh Arena after playing 15 top-flight games for the Magpies. Coventry's win over Wigan was their first on the opening day of the league season since they beat Portsmouth 2-0 at the start of the 2010-11 campaign. He says dropping down two divisions is still a big challenge. "It's still a good standard in League One - they're all good players and you've got to work hard," he added to BBC Coventry and Warwickshire. "There are definitely goals there from all over the pitch. It's just confidence. We need that and hopefully we've got it now and can push on." Are the Ashes becoming predictable? Read more on Ashes 2015: Is home advantage becoming too important?